Honolulu Museum of Art » Miss Sharon Jones! Home / Events / Doris Duke Theatre / Films / Miss Sharon Jones! Directed by Barbara Kopple. USA. 2016. 93 min. 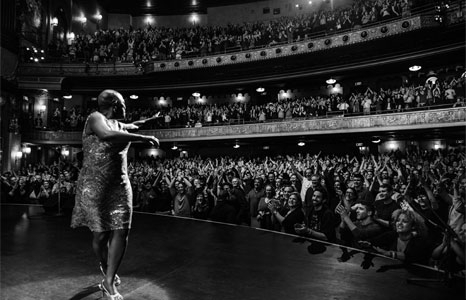 Sharon Jones says she was told she was “too short, too fat, too black and too old” to be a performer. The powerhouse soul singer finally began to find her place in the spotlight when she was in her 40s, after joining the Brooklyn band the Dap-Kings. The group enjoyed success with rousing hits such as “100 Days, 100 Nights.” Then, on the eve of the release of her last album, Jones was diagnosed with pancreatic cancer. Tour dates were cancelled, the album pushed back and she began a fight for her life and career. Miss Sharon Jones! intimately follows a courageous year in Sharon’s life. Tragically, the shimmying firecracker was extinguished in November.